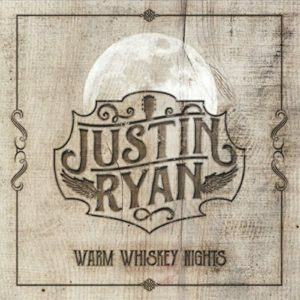 The shunky beat of “Do a Little Dancin’” opens Justin Ryan’s 12-song album Warm Whiskey Nights. It’s an early introduction to the man’s solid songwriting, slight nasal twang, and the singable choruses he will reveal along the way here. There is also a lead electric piano I really like. “Like She’s Already Gone” features mandolin and a wry lyric about what a man may do for a woman, and what he might not. Again, a big singalong chorus is introduced here. “How Will I Know When It’s Over (Heart In Handcuffs)” is the first real big ballad on Warm Whiskey Nights, informed with acoustic and pedal steel in the background (a combination Ryan will use again on another sweet ballad, his title track here). This lyric is particularly sad, mining that concern we all have met too often in our lives. “Take a Little Time” gets us all upbeat and movin’ again, with acoustic guitar and snare leading us. Ryan’s vocal delivery (and his fine use of harmonies in the chorus) infect this one expertly. A plucky electric guitar and slightly distorted vocals makes “It’s Only Rain” truly sound unlike anything else before it. There is atmospheric glistening in the background and sweet harmonies before we lose the interesting tonal quality, get into a normal beat, and return to the clean sound we have throughout the record, though I would have preferred him to stay tight and weird throughout. “Love Me When I’m Rainin’” has Ryan singing his heart out, strumming his electric, as things get dramatic with organ, drums, and pedal steel on this fine album’s ender.